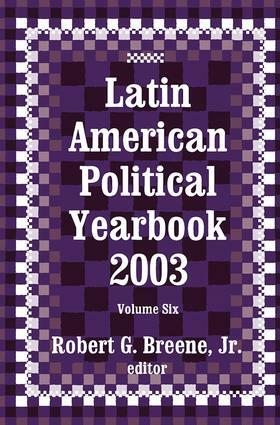 In the sixth volume of this annual series, Robert G. Breene provides a comprehensive overview, analysis, and summary of the political and economic trends and events in Central America, MERCOSUR, the Andean and Caribbean nations, and Mexico. Analyzing these developments within the individual nations, their respective regions, and the world at large, this yearbook offers a timely look at the relevant background and information necessary to understand the changing nature of politics in Latin America today.A significant development has been the growing nexus of Marxist-Leninist and Muslim terrorism. Before the turn of the new century, portents of this development were discernable in the long terrorist war conducted against the democratic West by those followers of Lenin, Stalin, and their successors. This has now been transformed into a "crusade" against non-Muslim societies. The materials included here attest to the fact that the hemispheric left and Cuba were involved in terror long before it suddenly materialized in the United States. As this volume records, Castro was in Teheran in May 2001 where he pledged that "the peoples and governments of Iran and Cuba can bring the U.S. to its knees." Four months later, terrorists of the Al-Qaeda network destroyed the World Trade Center and struck the Pentagon. In replying to this outrage, the Bush administration identified an Axis of Evil, which did not include either the Cuban or Chinese Communist regimes, two original seats of international terror. As this volume demonstrates, however, whether neatly includable in the "axis" or otherwise, Castro and his political allies u Hugo Rafael Chbvez Fryas of Venezuela, Lula da Silva of Brazil, and others u are closely associated with at least one avowed member state of the Axis.In addition to its analysis of these and other new developments, the Yearbook continues its invaluable coverage of election results throughout Latin America. Brimming with information not readily available through the American media, this series is essential reading for political scientists, journalists, Latin America area specialists, and historians.Robert G. Breene, Jr. has been a fighter pilot, a newspaper correspondent in Central America, a professor of physics, and the owner and operator of a 600-head cattle ranch in Nevada. He is currently head of the Latin American News Syndicate in San Antonio, Texas.